#199. Forest Interior. 14 x 19, oil on wood panel. "Gilbert Munger" reported somewhere on the front. Listed in the catalog of the National-Galerie, Berlin as No. 731 from 1898 to 1914. Later it was transferred to the Pergamon-Museum, Berlin, from where it was stolen about 1945. The painting appears in the CD-ROM "Nationalgalerie: Gesamtverzeichnis der Gemlde un Skulpturen," 1999; and also appears on http://www.bildindex.de. 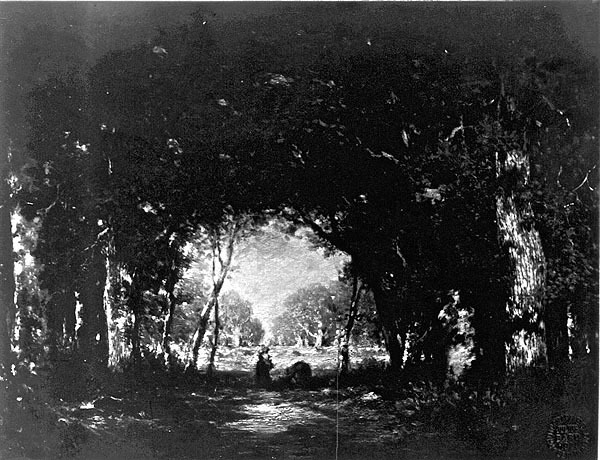 The scene is very similar to that depicted in painting #193. Image from CD-ROM, as emailed by Manfred Tschirner, Staatliche Museen zu Berlin.